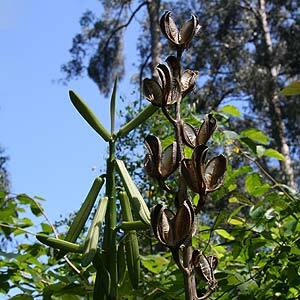 One of the real wonders of the lily family is Cardiocrinum giganteum, often refered to as The Giant Himalayan Lily. Now we do need to warn you it is monocarpic bulb, it flowers, sets seed and then it dies, and it may take 7 years to flower from seed. A few writers claim that because it produces offsets it is in fact not monocarpic, however in the definition, these are new plants, the basal plate separates and the offsets are divided, the old plant dies. However it does put out offsets and these will flower in time. So the trick is to plant one each year for 7 years and then you should have them flowering every year. Or just be patient and enjoy the large deep green heart shaped foliage in the 'non flowering years. 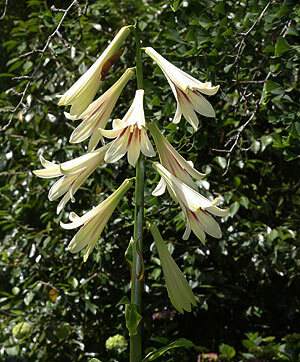 Cardiocrinum giganteum var. yunnanense has a nice touch of crimson in the flowers. Cardiocrinum cordatum seems to have broader petals. Good filtered shade, a deep humus rich moist soil and your Cardiocrinum giganteum will be happy, little to no care is required. Some liquid seaweed fertilizer if you wish. The old seed heads will hold on right through the season and can still be in place the next spring when new plants are flowering. Collect the seeds and remove the seed heads if you wish. Propagation is by dividing the offsets or by germinating the seeds. Sow seeds in containers and placed in a shaded position, watch out for slugs in spring. The 'plastic baggy' method of stratification can be a little quicker. Annwell Lane Sm isby nr. Ashby de la Zouch Derbyshire LE65 2TA Owner: Robert and Suzy Vernon.